A family - two little girls, a mother and father - dressed to attend church services. The little one was upset. She had seen the pink snowsuit the mother purchased her for Christmas, and she wanted to wear it that day! Had the little girl known how soon and why she would be wearing that outfit, perhaps she would have acted differently . Church service was uneventful and the family soon climbed back into the father's green Nash and started the trip home from church. Mother and father in the front seat and the two girls in the back. A short distance from the church, they were stopped by a red light. As the light turned green, the father stepped on the gas in order to proceed through the intersection. Almost simultaneously, the mother screamed at the top of her lungs “Lewis” a split second before their car was hit broadside by a truck. The father was thrown from the car and lay bleeding on the cold concrete, blood flowing from his neck area. The mother was knocked unconscious - and though she lived another 50 years, she never remembered the crash. The girls were able to get out of the car - the older one, though upset and crying, held onto and and tried to shield the younger girl. At the sound of the crash, people ran out of a restaurant on the corner. One of these bystanders was the student teacher assigned to the younger girl's kindergarten class. She comforted them until help arrived. The family was soon placed into an ambulance and rushed to the hospital. Swiftly the emergency room was filled with family members and friends. The father was the oldest of 11 and the mother the eldest of seven, and it seemed like all of them were there. Once the girls were checked out by staff and released, someone took them to their maternal grandmother’s house which was in chaos. Everyone was weeping and trying to keep the grandmother calm. It hadn't been that long since the grandfather died and now her oldest son - the now head of the family - was in grave condition. The younger girl went with her cousins to play in the cellar. Suddenly an ear splitting scream rocked the house. The little girl looked at her cousin and quietly whispered “My Daddy is dead”. And in the blink of an eye nothing was ever the same! 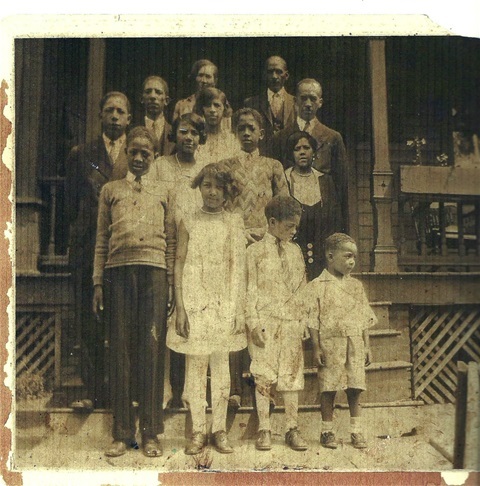 In Memory of my father - Lewis Melvin Richardson, Sr. pictured with his famiy - he's standing in front of his father on the right.